Niko Kranjčar (pronounced [nǐːko krâɲtʃaːr]; born 13 August 1984) is a former Croatian professional footballer. He primarily played as an attacking midfielder, but could also operate as a winger or second striker. He has played with clubs in his homeland, playing for Dinamo Zagreb before sparking controversy by making a move to their fierce rivals Hajduk Split in January 2005. A transfer to England with Portsmouth soon followed in August 2006, and after several years of attempting to hold on to their key players, Portsmouth decided to sell him at the start of the 2009–10 season, opening the way for a move to Tottenham in September 2009, where he was reunited with his former manager at Portsmouth, Harry Redknapp. Hailed as the next Robert Prosinečki, Kranjčar was given his international debut by his father Zlatko in August 2004. Since then, Kranjčar has represented his country in the 2006 FIFA World Cup, UEFA Euro 2008 and UEFA Euro 2012. So far he has won 81 caps for the Croatia national team, scoring 16 goals in the process. His latest match for the national team was on 15 October 2013, and he missed 2014 FIFA World Cup because of an injury. Kranjčar is the son of former Dinamo Zagreb and Rapid Vienna forward Zlatko and he spent his childhood years in Austria, where his father was playing. Therefore, he holds an Austrian passport and this qualified him as a European Union player prior to the enlargement of the EU and Croatia's admission in 2013. Kranjčar spent most of his youth playing for Dinamo Zagreb, and later, at the age of 17, became the youngest captain of the squad for the first time. He also became one of the youngest goalscorers in the Prva HNL as he scored on his league debut for Dinamo at the age of 16 before helping them win the double of a Croatian cup and a league title in 2003 and then the Croatian cup again the following season. Such abilities and assistance led him to become a fan favorite, he began to receive comparison to French football legend Zinedine Zidane. In January 2005 he experienced a disagreement with the Dinamo Zagreb management, which led to a surprise transfer to Dinamo's biggest rivals, Hajduk Split, which was accomplished thanks to Hajduk's sporting director Igor Štimac for a reported fee of €1.88 million. Over 10,000 people came to Kranjcar's official unveiling at the Poljud stadium. Kranjcar made his league debut for Hajduk on 26 February 2005 in a 2–2 draw against Osijek. He scored his first goal for Hajduk on 23 April 2005 at Poljud in a 5–1 victory against NK Inter. He scored his second goal in the decisive 6–0 victory against Vatreks on 28 May 2005. Kranjčar helped Hajduk win the 2004–05 Prva HNL which was their 2nd league trophy in a row. Thanks to his fine games and good sportmenship Kranjčar became the fans' favourite player instantly. Despite having a lot of international offers from abroad, Niko decided to stay at Hajduk for the next season. In the 2005–06 Prva HNL he was Hajduk's top goalscorer, with 10 goals. After the 2006 World Cup, the world press hailed Kranjčar for his talents, and several clubs immediately showed interest in the young star. Among such clubs were Stade Rennais and the Spanish Club Celta Vigo. In August 2006, Rennes bid €4.5 million for Kranjčar, which Hajduk rejected, stating they felt they should get more for the player. Later on the same day, however, Kranjčar then moved for a reported £3.5 million (€5.2 million) to Portsmouth on 31 August 2006. Kranjčar made his Premier League debut for Portsmouth on 1 October 2006 as he played all 90 minutes in their 2–1 away defeat to Tottenham Hotspur. He scored his first Premier League goal on 31 March 2007 at Fulham, giving Portsmouth an early 1–0 lead in a match that eventually ended in a 1–1 draw. He made a total of 24 appearances and scored two goals in his first Premier League season. The following season, he played an integral role in Portsmouth's FA Cup win. At the beginning of the 2008–09 season, AS Monaco apparently had a bid of £12 million rejected for Kranjčar, however this was denied by Monaco. On 12 February 2009, with Portsmouth battling relegation, Kranjčar publicly declared his desire to quit Portsmouth and move to a bigger club. Arsenal and AS Monaco have previously been linked with moves for the Croatian International. Everton manager David Moyes also expressed an interest in signing Kranjčar as a replacement for long-term absentee Mikel Arteta. In August, Kranjčar stated: "For now I am staying, but we have not strengthened like I would have liked us to. That's why I will not sign a new contract. It's one more season for me and then I'm off". On 1 September 2009, Kranjčar joined Tottenham Hotspur from Portsmouth after the two clubs agreed a transfer fee of around £2.5 million, although the actual price was undisclosed. The deal was completed just before the transfer deadline passed with him signing a four-year contract. It was reported that Everton had made a late bid to sign Kranjčar, but the player opted to sign for Spurs, stating that: "Everton is also a big club but, in the end, the tradition and greatness of Tottenham made the difference. I also knew manager Harry Redknapp, and Luka Modrić and Vedran Ćorluka told me great things about the club". Kranjčar made his debut for Tottenham as a substitute in the 3–1 defeat to Manchester United at home. On 26 September 2009, Kranjčar made his first Premier League start for Tottenham in a 5–0 home thrashing of Burnley. He scored his first goal for the club in a Premier League match away to Bolton Wanderers on 4 October 2009. On 22 November 2009, Kranjčar scored for Tottenham in a 9–1 home thrashing of Wigan Athletic, with Jermain Defoe scoring a record equalling five. On 16 December 2009, Kranjčar grabbed a brace in a 3–0 home victory over Manchester City. On 20 March 2010, Kranjčar scored the winning goal in a 1–2 away victory over Stoke City. Kranjčar has found difficulty being chosen in starting line-ups, due to the rise in prominence of Gareth Bale, who also plays in his position. However Kranjčar continued to make a pivotal contribution to the season scoring late winning goals in two consecutive matches, coming on as a substitute against Bolton Wanderers in a 2–1 victory at White Hart Lane, and away to Sunderland in another 2–1 victory. In the beginning of the 2011–12 season, Kranjčar scored a 35-yard goal during a pre-season friendly, a 5–3 win against Milton Keynes Dons. 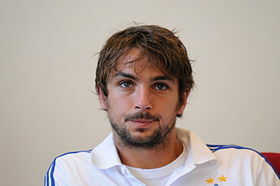 On 6 June 2012, Ukrainian club Dynamo Kyiv confirmed the signing of Niko Kranjčar on a four-year contract. The transfer fee was estimated to be about £5.5 million. After his move to Dynamo Kyiv, Niko Kranjčar says he is "happy" and satisfied" of joining Dynamo Kyiv and does admits his time at Tottenham was ‘disappointing’. Kranjčar revealed that Dynamo Kyiv first took interest in signing him in 2003 during his time at Dinamo Zagreb. He scored twice on Matchday 5 against Volyn Lutsk. He scored another two goals against Karpaty Lviv on 14 September 2012. After having a good beginning of the season, in November Kranjčar felt an old ankle injury, which left him out of the game until the end of the year. He came back just in time for the second half of the season, after the winter break, but managed to make only two appearances before he got injured again while performing for the Croatian national team in March 2013. This time he was left out of the pitch until the end of the season. After spending 2 years on loan at Queens Park Rangers from 2013 to 2015, Kranjčar returned to Dynamo Kyiv's first team. On 2 September 2013, Kranjčar joined Queens Park Rangers on a season long loan to unite with his former boss Harry Redknapp, who signed two other players from former club Tottenham Hotspur. This was the third time Redknapp signed Kranjčar, having previously worked with him at Portsmouth and Tottenham. After a groin problem delayed his debut, Kranjčar made his first appearance for his new club against Yeovil Town, coming on as a second halftime substitute. He made his full debut before the Loftus Road crowd against Middlesbrough in late September 2013. Kranjčar scored his first goal of the season in the match against Millwall, when he also made his first assist of the season and was voted "Man of the Match". In January 2014 he scored once again to give QPR a 1–0 lead against Ipswich Town. He left the club on 1 July 2014 following the expiration of his loan, but returned on the last day of the summer transfer window on 1 September 2014 for another season-long loan. After being released by Dinamo Kyiv, he went to USA and trained with Cosmos. However, he could not be a part of the squad due to foreign players' rule. In the middle of the March 2016, when one of the foreign players obtained American citizenship, Kranjčar finally signed for Cosmos. On 23 June 2016, Kranjčar signed for Rangers of the Scottish Premiership on a two-year deal, stating that it was a "big honour and privilege" and a "big responsibility" to be joining a club of such size. He made his debut for the club in a League Cup match against Motherwell on 16 July. and made his first start, three days later against Annan Athletic. Kranjčar scored his first goal for the club on 25 July, netting the third in a 3–0 win over Stranraer and netted his first league goal in a 2–0 win over Partick Thistle on 1 October. Kranjčar suffered a cruciate ligament injury in early October which would sideline him for the rest of the season. In January 2017, Kranjčar spoke about the progress of his rehabilitation and estimated a return in six-months; although he did acknowledge the severity of the injury could have led to him retiring. He made his return to competitive first-team action after eight months out, against Progrès Niederkorn in the Europa League on 29 June 2017. Kranjčar was released by the club on 23 March 2018, after struggling with injury throughout his spell in Glasgow. Kranjčar was previously a part of the Croatian national Under-16, Under-17, Under-19 and Under-21 teams before advancing to the senior national team. His senior debut for Croatia came on 18 August 2004 in a friendly match against Israel. He was a regular for Croatia during their qualifying campaign for the 2006 World Cup, making nine appearances and scoring two goals, including a brilliant single effort against Bulgaria. Niko was then chosen for "Young guns firing for World Cup glory" on eurosport.com with some of the greatest talents in the world, such as Lionel Messi, Lukas Podolski and future Pompey teammate Sulley Muntari. He went on to play in all of Croatia's three group stage matches at the final tournament, proving to be a prestigious player for his impressive performances. With the departure of his father as national team manager, Kranjčar became a regular for Croatia in their qualifying campaign for Euro 2008, having appeared in all 12 matches and scoring two goals. The most famous of such was his long range opener for Croatia during their final match away to England. Croatia eventually won the game 3–2, resulting in England's failure to qualify for the final tournament. He then scored in a friendly match against Scotland with a spectacular effort from just inside the penalty area in a match played that ended 1–1, the equalising goal coming from Kenny Miller. He was a part of the Croatia team in Euro 2008 tournament, being a starter in 2 group match games and quarter-final game against Turkey. In Croatia's campaign for the 2010 World Cup he scored a goal against Kazakhstan. He was included in Croatia's 23-man squad for Euro 2012 and played in two out of three group stage games, missing only the last game against Spain. He missed the 2014 FIFA World Cup due to hamstring injury and since then, he has not received a single call-up for any of the national team's future matches. His last international game was on 15 October 2013. Kranjčar was born to a retired Croatian footballer and manager Zlatko Kranjčar. He was married to Simona Fistrić and the couple lived in Cuffley, Hertfordshire. Fistrić gave birth on 7 March 2011 to a baby girl by the name of Loree. However, Kranjčar and Fistrić divorced less than a year after Loree's birth. ^ "Niko KRANJĆAR". FC Dynamo Kiev. Retrieved 30 October 2015. ^ "Croatian Dilemmas for the World Cup – Kranjcar & Kranjcar: In The Name Of The Son". soccerphile. Retrieved 1 September 2009. ^ "Pompey snap up three". givemefootball.com. 31 August 2006. Archived from the original on 7 September 2009. Retrieved 1 September 2009. ^ Macaskill, Sandy (24 February 2009). "Niko Kranjcar's Portsmouth future in doubt". The Daily Telegraph. London: Telegraph Media Group. Retrieved 1 September 2009. ^ "Kranjcar coy on Portsmouth future". BBC Sport. BBC. 20 May 2008. Retrieved 1 September 2009. ^ "Redknapp eager to keep Kranjcar". BBC Sport. BBC. 3 April 2007. Retrieved 5 September 2009. ^ "Spurs sign Kranjcar from Pompey". BBC Sport. BBC. 1 September 2009. Retrieved 5 September 2009. ^ "Niko Kranjcar Profile". ESPN Soccernet. Retrieved 5 September 2009. ^ "Niko Kranjcar, Croatia". free-football.tv. 4 June 2008. Archived from the original on 13 June 2008. Retrieved 18 July 2008. ^ T.O. Whenham. "Croatia World Cup 2006 Team Information/Outlook Page". Doc's Sports Services. Retrieved 5 September 2009. ^ "Kranjcar completes Hajduk move". CNN. 21 January 2005. Retrieved 5 September 2009. ^ "Fulham 1–1 Portsmouth". BBC Sport. BBC. 31 March 2007. Retrieved 5 September 2009. ^ "Portsmouth win FA cup". FIFA. 17 May 2008. Retrieved 5 September 2009. ^ Burt, Jason (18 July 2008). "Redknapp rejects £12m Monaco bid for Kranjcar". The Independent. London: Independent News & Media. ^ "Monaco deny £11.8m bid for Pompey's Croat star Kranjcar". Daily Mail. London: DMG Media. 24 July 2008. Retrieved 5 September 2009. ^ "Monaco deny Kranjcar approach". Metro. 24 July 2008. Retrieved 5 September 2009. ^ "Kranjčar seeks Pompey exit". Sky Sports. 12 February 2009. Retrieved 9 September 2009. ^ Moxley, Neil (24 February 2009). "Portsmouth playmaker Niko Kranjcar puts Arsenal on red alert after admitting he may leave Fratton Park this summer". Daily Mail. London: DMG Media. Retrieved 9 September 2009. ^ "Kranjcar dismisses Monaco rumours". ESPN Star. 20 June 2008. Archived from the original on 8 September 2009. Retrieved 9 September 2009. ^ "Moyes Targets Kranjcar". Daily Star. 25 February 2009. Retrieved 9 September 2009. ^ "Kranjcar: I'm off next summer". The News. Portsmouth: Johnston Press. 10 August 2009. Retrieved 2 September 2009. ^ "Niko Kranjcar joins Tottenham from Portsmouth". The Guardian. London: Guardian Media Group. 1 September 2009. ^ "Spurs sign Kranjcar from Pompey". BBC Sport. BBC. 1 September 2009. ^ Stevenson, Jonathan (12 September 2009). "Tottenham 1–3 Man Utd". BBC Sport. BBC. Retrieved 13 September 2009. ^ Lillywhite, Jamie (26 September 2009). "Tottenham 5–0 Burnley". BBC Sport. BBC. Retrieved 27 September 2009. ^ Lyon, Sam (3 October 2009). "Bolton 2–2 Tottenham". BBC Sport. BBC. Retrieved 3 October 2009. ^ Fletcher, Paul (22 November 2009). "Tottenham 9–1 Wigan". BBC Sport. BBC. Retrieved 22 November 2009. ^ Dawkes, Phil (16 December 2009). "Tottenham 3–0 Man City". BBC Sport. BBC. Retrieved 16 December 2009. ^ Thompson, Anna (20 March 2010). "Stoke 1–2 Tottenham". BBC Sport. BBC. Retrieved 21 March 2010. ^ "Niko Kranjcar gives Spurs the edge over Sunderland". The Guardian. Retrieved 4 February 2019. ^ "Tottenham's Niko Kranjcar completes £5.5m transfer to Dynamo Kyiv". The Guardian. London: Guardian Media Group. 7 June 2012. Retrieved 26 November 2016. ^ "Niko Kranjcar laments 'disappointing' Spurs career after Dynamo Kiev move". Metro. 7 June 2012. Retrieved 9 June 2012. ^ "Reunited! QPR manager Redknapp completes TRIPLE swoop for Carroll, Kranjcar and Assou-Ekotto as trio rejoin boss at Loftus Road". Daily Mail. London: DMG Media. ^ "QPR sign Kranjcar & Tottenham's Assou-Ekotto & Carroll". BBC Sport. BBC. 3 September 2013. Retrieved 16 January 2014. ^ Murtagh, Jacob. "Harry Redknapp wants to sign Niko Kranjcar on a permanent basis". Daily Mirror. Trinity Mirror. Retrieved 16 January 2014. ^ Murtagh, Jacob (4 October 2013). "Niko Kranjcar keen to make his move to Queens Park Rangers permanent". Daily Mirror. Trinity Mirror. Retrieved 16 January 2014. ^ "Millwall 2–2 Queens Park Rangers". BBC Sport. BBC. Retrieved 16 January 2014. ^ "QPR's Niko Kranjcar starts goal rush in fine win at Ipswich Town". The Guardian. Guardian Media Group. Retrieved 16 January 2014. ^ "Harry Redknapp reunited with Sandro and Niko Kranjcar at QPR". The Guardian. Guardian Media Group. 1 September 2014. Retrieved 2 September 2014. ^ "English FA Cup Winner Kranjčar Signs With Cosmos". NYCosmos.com. Retrieved 18 March 2016. ^ Davie, Chris. "Former Tottenham star Kranjcar joins New York Cosmos". Goal.com. Retrieved 18 March 2016. ^ "Rangers Sign Niko Kranjcar". Rangers.co.uk. Rangers Football Club. 23 June 2016. ^ Smith, Neil (23 June 2016). "A Move I Had To Make". Rangers.co.uk. Rangers Football Club. ^ McLaughlin, Chris (16 July 2016). "Motherwell 0–2 Rangers". BBC Sport. BBC. ^ "Rangers 2–0 Annan Athletic". BBC Sport. BBC. 19 July 2016. ^ Wilson, Richard (25 July 2016). "Rangers 3–0 Stranraer". BBC Sport. BBC. ^ "Rangers 2–0 Partick Thistle". BBC Sport. BBC. 1 October 2016. ^ "Niko Kranjcar: Rangers midfielder out for six months with cruciate damage". BBC Sport. BBC. 2 November 2016. ^ Walker, Mark (9 January 2017). "Rangers crock Niko Kranjcar lifts lid on injury hell that had him contemplating quitting". Daily Record. Glasgow: Trinity Mirror. ^ "Rangers 1–0 Progres Niederkorn". BBC Sport. BBC. 29 June 2017. ^ "Niko Kranjcar: Rangers midfielder's contract terminated by mutual consent". BBC Sport. BBC. 23 March 2018. Retrieved 27 March 2018. ^ Samuel, Martin (22 November 2007). "Inescapable truths that must not be screened by the Scott Carson horror show". The Times. London: News UK. ^ "Niko Kranjčar". hns-cff.hr (in Croatian). Croatian Football Federation. Retrieved 4 July 2017. ^ "Niko and Fistrić Simone big wedding in Zagreb". 24sata.hr (in Croatian). 18 July 2008. Archived from the original on 29 July 2008. Retrieved 12 September 2009. ^ "Niko Kranjcar and Simona in London received a girl". jutarnji.hr (in Croatian). 8 March 2011. Retrieved 11 March 2011. ^ "Šokantni razvod Nike i Simone Kranjčar" (in Croatian). 12 March 2012. Retrieved 11 October 2014. ^ "Niko Kranjčar". National Football Teams. Benjamin Strack-Zimmerman. ^ "N. KRANJČAR". Soccerway. Retrieved 23 June 2016. ^ McNulty, Phil (17 May 2008). "Portsmouth 1–0 Cardiff". BBC Sport. BBC. ^ Fletcher, Paul (24 May 2014). "Derby County 0–1 Queens Park Rangers". BBC Sport. BBC. Wikimedia Commons has media related to Niko Kranjčar. This page was last edited on 12 February 2019, at 13:30 (UTC).